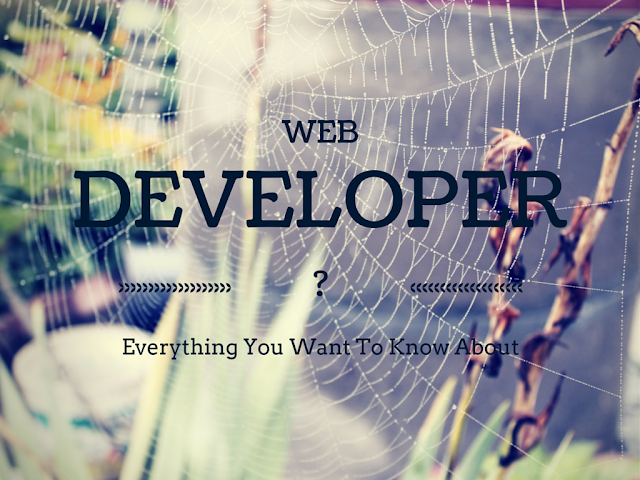 Wondering what is a web developer? Or want to find a job as web developer? We have created this article for absolute beginner to understand what it takes to be a web developer. A web developer plays key role in the process of web development. Web development simply means the process of creating interactive web pages and programming. A website contains dynamic and static webpages, and most websites interact with end users in multiple ways. Web developers write code for a website, which is mostly HTML coding and server side coding requires JAVA programming as well. Web developers work as freelancers, consultants, or as part of software and website development companies. They are also known as front-end developers or web content developers. How a website functions and interacts is based on programming codes that are written by a web developer. Clients use multiple browsers that are upgraded over time and a good website needs to run flawlessly on multiple browsers like Mozilla, Google Chrome, and Internet Explorer etc. as well as on different versions of the same browser. Websites are built and developed keeping the end user experience in mind. They need to be user friendly, aesthetically pleasing, and must fit the needs of a business as well as the consumers or end users. What Is The Work Place Of A Web Developer Like? A freelancer can be comfortably working from home, whereas a full-time or part-time developer may be working in the IT department of a company. In any case the job requires you to focus and sit in front of your computer for long stretches, for those who enjoy it and have the required skills, it is an excellent career. Consultants or freelance developers can accept assignments from different companies and this may involve traveling in some cases. What Attributes Do Companies Look For In A New Web Developer? Team work, collaboration and co-operation, a strong work ethic, meticulous precision in writing code and many other qualities are necessary. All are tested by recruiters in different ways during an interview. Skills, basic knowledge, and a positive attitude can help you get a good job. Being open to feedback is also important. Do some online research and make sure you have a good feel of the job, before you make any decision. Start small, do not be afraid of making mistakes, learn gradually, and try to start with simple projects. Persistence is the key to success. Great developers mostly have the passion and talent, but they are also people who are willing to work extra hard when it matters. 5 Key Qualities Needed To Become A Developer? A strong interest in computers, command over programming languages, creative bent of mind, passion and many other qualities can help you become a great front-end developer. Understanding how technology works over the web and what works and what doesn’t is very important. If you lack a quality to start with, it is not a big problem, as long as you are willing to learn and persistently work on refining your skills. It is important to have a strong foundation in basics. Begin by learning HTML and CSS. Avoid by-passing the need to learn these core skills, which can be done by using software’s like Adobe Dreamweaver. A professional developer learns gradually and spends time building skill. Additionally you need to learn Java Programming, an understanding of PHP, and learn additional languages to enhance your skills. necessary for a developer to adjust learning and learn appropriate skills. Also, keeping abreast of advances in technology and designing content which is effective on all platforms is an indispensable requirement. Technology needs to be explained to non-technical clients, communication skills can help you get the best contracts and accelerate career growth. You need to understand and listen carefully in order to design and deliver exactly what’s needed. Being a geek is not enough, spending time on developing soft skills will help you in multiple ways. and in many cases needs to be able to design and deliver a product all by himself or as part of a small team. If you want to become successful as an independent developer you must understand finance, marketing, client perspective, legal aspects and the end-user experience and needs. Its important to test any software before its send to the end customer or testing team. We have some key testing tips for web applications that you may find useful. I prefer to use a MacBook Pro for web development. Here are Best mac apps for developers. Use of effective online task management software for staying focused is essential. You may find some really useful apps on android device that can help you achieve many things from a mobile phone itself. Here are some productivity app on android for web developers. You also need to have almost all browsers available on your machine and load them with best addons. My favorite browsers are Firefox, Chrome and Safari. On Firefox, You may find these Firefox web developer tools really handy on Firefox. Google Chrome store has many good chrome extensions for web developers and designers. Google chrome is also a popular browser for testing responsive websites. There are tons of powerful responsive addon for chrome to perform responsive design. If you are using PHP for server side programming you may also need to choose Best PHP IDE for your needs. Java developers may use Productivity tools for Java developers. Technical people are familiar with technical jargon and can find it difficult to communicate effectively in layman’s terms. To be successful you must be able to put complex ideas into simple words, translate difficult concepts into common language and be a good team member. Non-technical members understanding and needs need to be considered and learning the art of communication is a part of professional growth. Clients need to be handled patiently, and both oral and written communication is necessary, choosing the right words, the right tone of voice makes things work in every profession. For a Developer it is often necessary to sacrifice a bit of sleep sometimes. You may need to work through the night to meet a deadline or sort out an issue. Being comfortable with these demands and a willingness to work extra hard helps you build a reputation as a freelancer, or can give you success in an organization. Losing sleep can get you stressed out, making up for it by relaxing when you can, and balancing your personal and professional life is something every IT professional learns on his own. Coding and development takes patience and time, the best approach is learning how to remain relaxed while working and learning how to enjoy yourself on the job. A routine is helpful in keeping you working through-out the week at optimum capacity. Try to get enough sleep (when you can), and make sure you eat right. The most important thing is to learn how to keep things under control, being aware of when to take a break, developing awareness about the bodies needs, and learning when to stop. For those who have a strenuous assignment, relaxation techniques, and breathing exercises can help. Striking a balance helps you reduce anxiety, moreover it enhances productivity. Some more software developer productivity tips. Some assignments can be challenging and others might make you stressed. Developers need to find a balance between personal obligations and professional commitments. Lifestyle modifications are necessary and cannot be learn immediately. You must know what you’re signing up for, once you choose a career. Knowing your limits is important, and a laid relaxed attitude can limit your professional growth, whereas becoming a full-time workaholic might create chaos in your personal life or adversely impact your health. The human body needs a balance of mental and physical activity. Coding can be a mental drain if physical activity is ignored. Try simple stretching, taking a walk, breathing exercises, or anything that works for you. Physical activity improves blood flow in your body and ultimately enhances work performance. Health is important for sustained performance and balance can be maintained only if you give it priority. At times the urge to complete a project can make you drive yourself beyond your limits, and ignore your needs. Balancing different aspects of your career, professional life, and managing your personal life, all require skills that each person learns on his own. Remaining healthy and functioning at your best helps in building a strong career. Technology is dynamic and changes continuously, keeping abreast of the changes is possible if you keep learning and exploring with an open mind. Not all companies use the best methodologies, being a part of a team is great, but, the market for a Developer is huge and learning everyday will help you retain the edge and prevent stagnation. Keep yourself up to date with latest web development trends and constantly look for design inspiration. New things can be learn over the web, if you know the right resources, the internet is a treasure trove of information. Learning actively makes a huge difference. Did you find this article useful? Please click share buttons below.